Where art and the elements meet purpose. Boards of Hope is a project that brings artists and the boards we ride together for an empowering display of art, healing, and the outdoors. Any artist can participate in Boards of Hope. Recycle a board — skateboard, snowboard, kiteboard, skimboard, surfboard — repurpose it, and transform it into a work of art. This is Boards of Hope! Boards are exhibited at, and auctioned off at Kiteboarding 4 Cancer Saturday, July 14th. The event’s beneficiary, Project Koru, invites fighters, survivors, those touched by cancer, and artists of all mediums to submit entries for Boards of Hope. Funds raised from BOH will benefit Project Koru cancer advocacy, prevention, and survivorship programs: Camp Koru, This is Life Workshop Series, Kite it Out, and Koru Leadership. Artists must obtain their own recycled boards and art supplies to create board. NO standup paddleboards or windsurf boards. Complete the Board Submission Form when you are ready to submit your work. 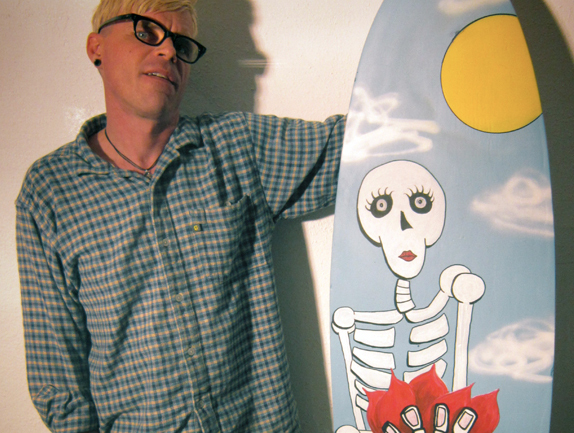 Boards are not intended to be ridden after artwork. Artists are encouraged to use a variety of mediums including acrylics, acrylic paint pens, sharpies and collage mediums. Works must be completed and delivered to the Project Koru office, or arranged for delivery, by July 1st. All submissions are donations to Project Koru and will be auctioned off at Kiteboarding 4 Cancer’s Live Auction at the Hood River Event Site Saturday, July 14th. Professional artists please direct interest to Tonia Farman - tonia @ projectkoru.org. Board Submission Form: Submit here. We strongly encourage SURVIVORS & FIGHTERS to submit their art! Boards of Hope began from the hospital bed of 19-year old Scott Farman, fighting for his life with Acute Lymphocytic Leukemia. Scott turned to art for emotional release when confined in the hospital. In the process, Scott created powerful works of art that today remain his legacy and inspiration for others to find healing through art & the outdoors. Scott’s legacy continues today in our survivorship camps with an art studio for participants’ to express own personal journey with cancer.